While they're time-consuming to shell and peel, flat, jade-colored fava beans are considered a spring delicacy. The beans have a delicate flavor that's especially good with anything creamy. While they're time-consuming to shell and peel, flat, jade-colored fava beans are considered a spring delicacy; in the Northeast, we're often lucky enough to have them into the early summer. The beans have a delicate flavor that's especially good with anything creamy. 1. Soups Use favas to make spring versions of classic bean soups, like this pasta e fagioli. 2. 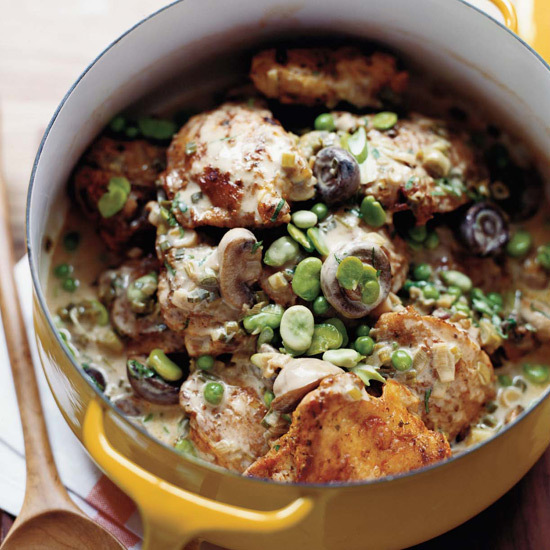 Spring stews Add favas to creamy stews, such as this insanely delicious beer-braised chicken. 3. Char 'em Grill them while they're still in the pods (yes, really) or peel the favas and char them in a super-hot skillet. Either way, serve the beans with lemon and herbs. 4. Mash 'em Smash favas into a rustic puree to smear on bruschetta with fresh cheese or simply serve the mixture alongside fish. 5. Glorious spring salads Serve favas warm and lightly dressed tossed with asparagus and peas, or use them to make a more substantial salad with brown rice or quinoa. 6. Early summer gratin Cook favas and mix them with zucchini and cream before topping with crispy panko crumbs and boiling. 7. Pasta and risotto The beans are great anywhere you might add peas, like in pasta carbonara. You can also make a rice-and-beans riff by mixing the favas into risotto along with plenty of herbs.